I've been slowly wending my way through my aedes.com samples of Annick Goutal. Thus far, oddly enough, since I don't think of myself as attracted to "powdery" scents, it is Heure Exquise which stands out. It has an eternal quality. Powdery fragrances can so easily smell, well, cheap, or generic, which is worse than cheap...Heure Exquise emerges because it has sufficient individuality. Neroli is still in the running; I've worn it several times. Here it would depend on how you feel about citrus scents; it's almost as citrus as it is floral. Songes remains on my first-pass list as well. I've briefly tried (or retried, rather) Gardenia Passion and Nuits d'Hadrien. 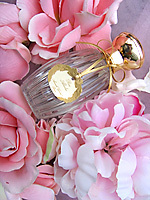 Gardenia Passion is easily the best, most authentic gardenia perfume I've tried. You'd have to be nuts about gardenias however; it is what it says it is, just gardenia. Nuits...I'll need to try some more before commenting. Rose Absolue...I've decided against, for purely personal reasons; I'm not a rose gal after all. That would explain why I've gravitated toward many a rose perfume over the years, from Evelyn by Crabtree & Evelyn, to Stella by Stella McCartney, to Rose Absolue itself--it's a rich, classical rose; deep red, many-petaled and velvet--rather than a light, modern, tinny rose--but never bought one. Passion is what I'm wearing today. I can't decide whether I like it or not. It honestly smells like something I smelled in the 1970's, but I can't put my finger on it. It's not unpleasant. Just...eh...not me.